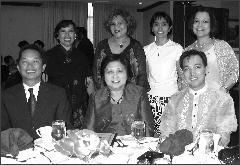 On July 13-17, 2005, the Philippine Nurses Association of Greater Kansas City, will host the 26th PNAA annual convention at the Hyatt Regency, Kansas City Missouri. The theme of the event is Creating Partnership for a Preferred Future ,Sharing Vision, Values and Leadership. We have invited brilliant and experienced speakers to discuss several issues that affects nursing today and its future. Among the topics that will be addressed are the demands of maintaining professional proficiency, keeping up with the latest technology, the influx of foreign trained nurses , building and sustaining a positive partnership in the workplace, the increasing and diverse needs of the clients we serve, building partnership and leadership, the uncertainty of and the future of nursing. We are optimistic that this event will, revitalize , invigorate and empower nursing practice. L-R. Front row: Tess Laoruangroch, Vicky Herrera, Cora Zamora; Back row: Marilyn Carino, Mayie Vilkins, Elvie Leone, Helen Austria, Beth Rosas, Irma Labre-Wright, Alice Alcazaren, Ruth Knutter, Sonia Tumanut. PNAGKC convention delegates: L-R back row- Joy Doolin, Irma Labre-Wright, Amie Valera, Beth Rosas. ; front row - Ernie Rosas, Mila Velasquez (PNAA President) and Rizvend Pecana. same time strengthen the PNAA organization as a whole. 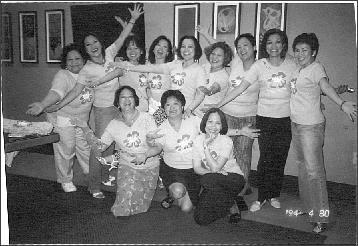 Copyright 1996-2019 Philippine Nurses Association of Greater Kansas City. All rights reserved.